Experience a trip of a lifetime in the Galapagos! Practice Yoga everyday and learn how to Stand Up Paddleboard as we explore the islands! Our Trip will begin with a flight from Quito to San Cristobal Island. Our arrival onto the island will consist of a visit to the Interpretation Center and a walk to Frigate Hill. 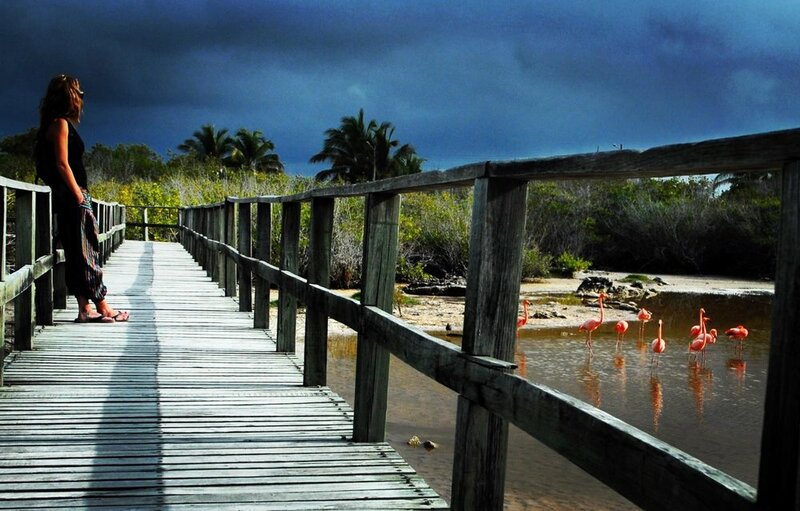 San Cristobol is the Island Charles Darwin first stepped foot on in 1835. Frigate Hill is a lookout point, with a panoramic view of Shipwreck Bay to the south and Kicker Rock to the west. The hike is approximately 45 minutes to get to the top with several panoramic viewpoints along the way. Frigate Hill gets its name from the Frigate birds we may see nesting in the trees. An early evening short yoga practice will be offered to take help the body adjust from our travels and settle into our journey. 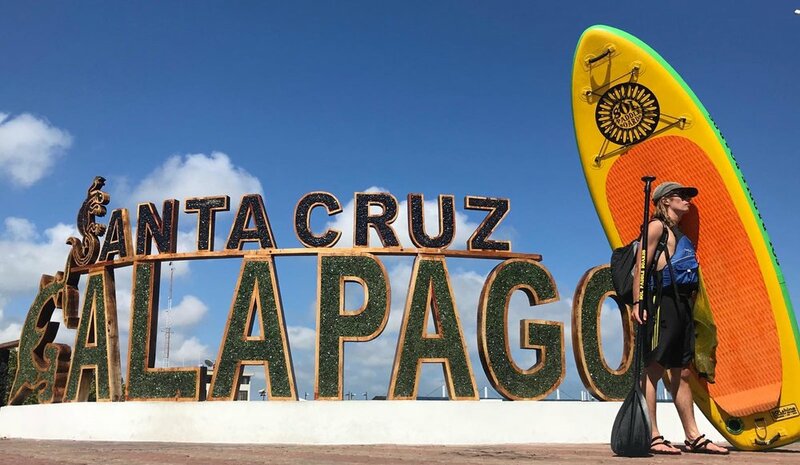 We will be spending our first 3 days of the trip on San Cristobal practicing Yoga every morning and adventuring out with our SUP boards to different remote areas of the island. Our mornings will begin with a yoga practice and breakfast. After breakfast we will prepare for a day of snorkeling and SUP Yoga at Playa Loberias & Ochoa and Kicker Rock. At this point the wild life will be abundant as there is much of it to observe on these beaches such as sea lions, iguanas, hermit crabs, turtles, and even blue-footed boobies. We will have the opportunity to snorkel, SUP or just relax and just let nature be our greatest teacher. Each day we will have Breakfast at our lodge and bring a snack lunch for our day trip. Yoga will be offered before breakfast and also a short practice will be offered on the SUP boards in order to get comfortable with our balance on the boards. In the morning on our fourth day after a yoga session and breakfast we will transfer by boat taxi to the Island of Santa Cruz. This is the second largest island and also the most populated urban center in the islands. During the day we will visit Laguna de las Ninfas (Lagoon of the Nymphs). The Lake is formed from the crater of an extinct volcano. The name is due to a type of flower that grows around the lake. This peaceful lagoon has a short boardwalk path, where you can stop to take in the mangroves while looking for stingrays, baby sharks, sea turtles and other creatures sometimes spotted here. One of the more interesting species found here is called the lava heron. Its unique blue-grey coloration is designed to blend into the lava rocks. Like many species here, the lava heron is endemic to the Galapagos as it is only found on the islands. After our yoga practice and breakfast in the morning we will continue on to our third Island visit, the beautiful Isla de Isabella. Named after Queen Isabella of Spain, this is the largest island of the Galapagos and also the youngest of the islands. Formed from the merging of 6 volcanoes, 5 of which are still active. The island sits along the equator and is primarily noted for its geology, providing excellent examples of a geologic occurrence that created the islands. This island is where our Galapagos experience truly begins. In the evening we will have a nice SUP yoga to the Tintoreras Islets where iguanas, boobies, penguins and seabirds can be observed. Returning to our lodging for dinner and relax for the evening. Our 6th day we will have yoga in the morning as usual and breakfast. We will then to prepare for a day hike inland and experience the moonscapes, lava formations, calderas on the island. We will accommodate the hike according to our group and the type of adventure we are seeking. There are many opportunities and not one of them is better then the other. Some hikes may be more challenging then others and we will decide during your stay which one we will be doing. On our seventh day we will be making our way by boat back to Santa Cruz and there we will be visiting the lava tubes of Santa Cruz and Tortuga bay. The cooling process of liquid magma creates the lava tubes of Santa Cruz and it is possible in different area s of the island to walk or paddle through the tubes. The most popular is the Tunnel of Love, so named for the heart-shaped hole in the ceiling. We will spend our time relaxing on the beach, a SUP yoga practice will be offered and visiting town in the evening to possibly practice speaking Spanish with locals. On our last full day at the islands, we will spend our day relaxing and going for a snorkel on Turtuga Bay. Visit the Charles Darwin Research Station and the legendary Galapagos Tortoises in their natural habitat. Our last evening together will consist of a Yoga closing ceremony and a dedication and gratitude circle discussion to the shared experience. We will be having an early breakfast and making our way to the Baltra Airport to fly back to Quitos Airport. From there you may book your reservation for the evening flight back home. Most flights returning to the US are in the evenings starting around 6pm. Flights should be arranged to Quito, Ecuador. To visit as a tourist, you will need a valid passport. The passport must have an expiration date of greater than six months after your return date. You will receive a migration form from the airline you fly with. Please keep this form with your passport at all times. You must have it to exit the country. Participants will need to book their arrival flight no later then Thursday November 1st, 2018. We will be meeting with you on Friday morning in the lobby at a small Guest House near the airport called Arie's Bike Company. The information for this Guest House is in the link, just click here. Rooms are only $25/night. This is the most convenient place to stay when you arrive into Quito from the Airport as we will be leaving for the islands on Friday from the same Airport. If you wish to stay at another hostel, you will need to meet with the group at Arie's at 9am on DAY 1, Friday, of the trip. Please let us know what your plans are. You will be responsible for making reservations for the beginning and end of this trip. If your flight leaves on Sunday evening then you need to book a room for the end of your stay. Meals will be served at three different lodges we will be staying at on the Galapagos. We will go out of our way to accommodate special eating restrictions, but take into consideration that we will be experiencing a different culture with food specialties we may never have tried before. Do not anticipate food to be prepared the same as at home. Dishes tend to be grilled with very few sauces. 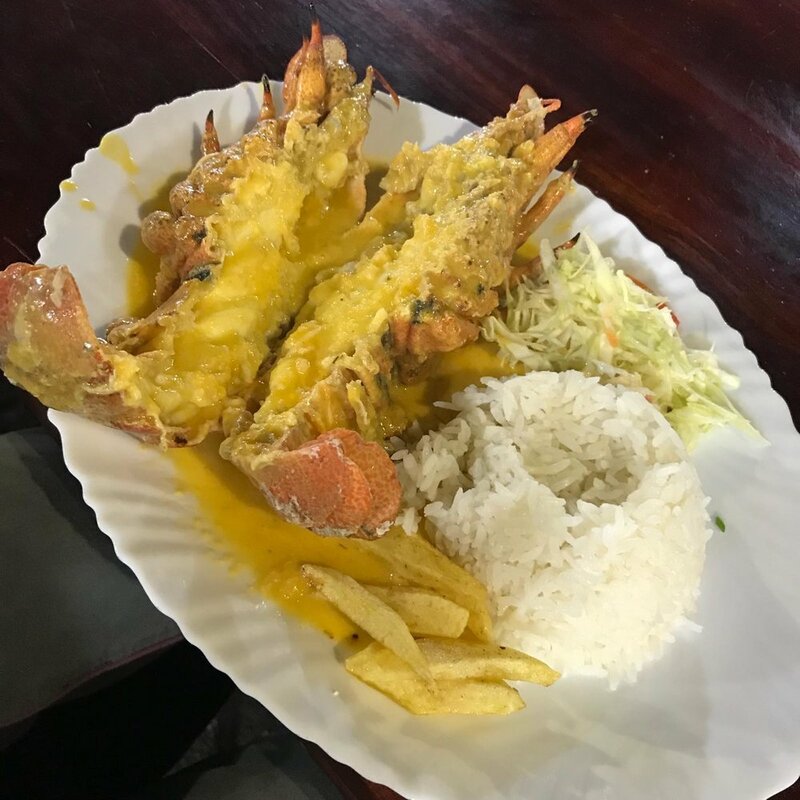 On the Galapagos there will be a lot of sea food options as well as vegetarian dinners. In general, fresh fruit and eggs are ubiquitous, and rice, yucca and potatoes are staples with every meal. The only real challenge in islands is gluten-free and vegan options. We recommend you bring gluten free bread and/or tortillas with you. There is a Participant form that asks about special dietary requirements. If the requirements seem specific we will need to talk on the phone about how to accommodate your needs. The November months can be cool. the season is usually cloudy and dry. The average temperatures are 70-80 degrees Fahrenheit during the day, cooler in the evenings. The water temperature is approximately 65-75 degrees Fahrenheit. Quito, the capital of Ecuador, is a beautiful city. At 9,400 ft., it is surrounded by snow-capped volcanoes ¾ just 24 kilometers from the equator. Although it was an important Indian City in Inca and pre-Inca times, its indigenous buildings have been erased, and today it is divided between the colonial architecture and sculpture of its Spanish conquest days and the clean line of its modern section. This combination of well-preserved colonial churches and contemporary architecture makes it one of the most beautiful cities in the whole of Latin America. Quito is very urban, full of ex-patriots, and their influence is everywhere. It is a well-traveled country for Europeans and staying in Quito will be one of the highlights of your trip. Although only 25,000 people populate the idyllic Galapagos Islands, it is home to storied cultural diversity defined by a mix of various ethnicities, customs, and traditions. Annexed by Ecuador in 1832, this volcanic archipelago constitutes one of the four ecological zones of the country and has cultural influences from Europe, the U.S., and mainland Ecuador. When you go on vacation in a foreign country, leave your North American time schedule behind. Life moves at a different pace in Ecuador. You will find that many times you will hurry up, just to end up waiting. Remember, you’re on vacation so leave your watch behind and let us do the logistics for you! To visit as a tourist, all you need is a valid passport. You will want to make at least one copy of your passport before departing home. You should carry a passport or photograph/copy of it at all times. No vaccinations are required to enter the country. Diarrhea is the most common illness. We personally recommend Hepatitis, Tetanus and Flu Shots. In addition, do not drink the tap water (bottled water is readily available). Stay clear of uncooked vegetables, salads not properly treated or unpeeled fruits. Malaria is a small risk in the lower coastal regions. click for most recent report on Malaria. We strongly encourage you to consult your personal physician about what would be best for you. Check with the CDC current information on travel to Ecuador. (click for link) You are responsible for making your own decisions regarding travel vaccinations and all participants are required to have travelers insurance for the entire time during the ten day trip. Bring strong sunscreen and a hat. Altitude sickness can sometimes affect travelers arriving in Quito. Andean air is thin, so take it easy for the first day. Plan on bringing your money in small bills ($5 and $10 bills). It is difficult to find change for large bills (and a $20 is considered large on the street!). Major credit cards are accepted in larger hotels, restaurants and shops in Quito. Us dollars are used on the Islands so there should be no need to exchange money unless you are traveling before or after this trip in Ecuador. If you need to stay in touch with those at home, plan on the following: In Quito it is effortless. There are Internet Cafes on every block, providing inexpensive computer time and Internet phone calls. Cell phone service is exceptionally good in Ecuador. But check with your carrier about an international plan before you depart. Take caution making a phone call from a hotel room or through a US phone service—both are very expensive, especially relative to the Internet or phone cards. Once out of Quito, you will have daily Internet access, although not always reliable. Most places we will be staying has internet on the islands but it is very slow. Best to leave your internet needs behind and enjoy the way of island life and simply relax. There is a book list on this web site with good books to bring on the subject of Galapagos. Ecuador offers such a great diversity that we cannot possibly acquaint you with it all in your days of paddling. We highly encourage you to spend some extra time touring Ecuador’s fascinating sites. Options to get you started include: time in Quito with its churches and museums and great places to just “hang out”; climbing Volcano Cotopaxi or Chimborazo; Amazon Jungle Tour; 1-day bike trips from Cotopaxi; and the Otavalo Market. This is an all inclusive trip meaning from the time I meet you in Quito on Friday morning at 9:00am till the time I drop you off on Saturday in Quito, everything is included in the price. Meals start with Lunch Friday, November 2nd and end with Breakfast on Sunday, November 9th. All lodging, airfare from Quito to Santa Cruz, boat transport and all the listed activities available along with professional guides to help keep the trip safe. A $500 deposit will secure your spot. The cost of this trip is $3,500 and must be paid in full by Mid-night Sunday September 16th. You will need to add $450 if you want a single (by yourself) room. Most rooms are double occupancy and all participants will be sharing rooms with one another. If you are traveling with a friend or a partner then you will get a double to share. The reason for the early deadline is to make sure we are able to reserve everyone's flight to and from Galapagos. We must have 6 weeks purchase in advance. ** There are only 12 spaces available for the Yoga and Adventure Trip to Galapagos. Once you have made a payment or a deposit, you are on the list. A $500 deposit is required if you would like to reserve your spot in this program before , september 16th 2018. The option is the first on the drop down menu below. There is a $250 cancellation fee for anyone who decides to cancel their trip before August 1st. There is a $750 cancellation fee for anyone who decides to cancel their trip after September 16th. Please fill out the form below when registering, thanks! This trip requires a certain amount of strength and endurance for all daily activities. If there are any concerns about your health or ability to do any of the listed daily activities please describe below and we will talk with you on if this trip is a good fit. Lodging will be shared rooms. If you would like to have a single room to yourself there will be an extra charge of $450. Please Describe any food allergies or special diets and we will do our best to accommodate you. He will set you up and answer any questions you may have. We plan to do yoga everyday in the morning and in the evening. Depending on what the group is in the mood for we have the knowledge and experience to offer a style of yoga that fits the moment and with the activities we will be doing daily, this is important! All together we have a training background in Vinyasa Flow, Prana Vinyasa, Ayuryoga, Iyengar yoga, SUP Yoga, Restorative Yin Yoga, Yoga Nidra and Trance Dance Yoga. It is so exciting to offer a trip with one of my closest friends. The knowledge and background you will be receiving in healing arts during your 9 day adventure is what makes this trip so special. Our teaching bio's are below. Kristi Murrin grew up in West Virginia and moved to Colorado in 1990. She began her studies with healing arts when she first went to an acupuncturist in Crested Butte for chronic back pain. She was recommended to an Iyengar yoga class and after the first week of classes she knew yoga would always be an important part of her life. Her interest for the healing arts grew and in 1993 she moved to Boulder, Co to begin her studies in Homeopathy at the International School of Homeopathy. There she spent four years completing a certification program for Homeopathic Consultation. At the same time she continued her education at the University of Colorado and graduated with a Bachelor of Science degree in Molecular, Cellular and Developmental Biology. Her passion for adventure and travel led her to a job teaching at a traveling high school for teenagers who are advanced whitewater kayakers. For six years she travelled around the world teaching math, science and occasionally yoga to the World Class Kayak Academy Students. She still has a great passion for the sport of whitewater kayaking and has kayaked in Africa, China, Chile, Mexico, New Zealand, Peru and all over the US. In 2010 she decided to travel to Indonesia and complete her first of many certifications to teach yoga with the School of Sacred Arts. Since then, she now has over 500hrs of training with Shiva Rea, the creator and founder of Prana Flow©, a vinyasa style of yoga that integrates natural body movement with the alignment of breath and asana. Her most recent studies have been focused on the ancient teachings of Ayurveda, and has completed her 500hr certification as a AyuryogaÒ Wellness Consultant with Maria Garre and Dr. Vasant Lad at the Ayurvedic institute in Albuquerque New Mexico. Ayurveda teaches the art of living in harmony with the five elements in nature. She is also trained in Ayurvedic Marma Point Therapy and Pulse diagnosis. In the last two years, Kristi has been invited to teach weekend seminars for Yoga Teacher Trainings on Ayurveda, Yoga Nidra, Restorative Yin Yoga and Vinyasa Flow. She has a love of teaching and travelling; two activities she is finally meshing together to create magical trips focused on creating an environment for any adventure enthusiast who enjoys exploring the natural environment and a deeper connection to their personal self healing, growth and awareness. Abe and I have been friends now since I first traveled to Ecuador in 2015 for a Kayaking trip. We became friends immediately. We both have worked for World Class Kayak Academy and shared funny stories about traveling to different countries with teenagers kayaking some of the biggest rivers in the world. His great sense of humor and willingness to accommodate visitors to his home country, Ecuador, is infectious. He has a lot of passion for traveling, exploring and just living the good life. Abe and I lead a trip to the Amazon together in November 2016 and it was one of the best trips I have ever been on. It was super easy to lead a trip with this super fun and also highly experienced outdoor adventure enthusiast. It was nice to know that I had someone else who has had many years of experience on the rivers and leading trips as I have had. We work well together and I look forward to leading this trip with him. Abe has been a trip leader in the Galapagos Islands for 5 years introducing the area to the new sport of SUP boarding. He has great knowledge and experience on the islands and believes SUP boarding is the best way to explore the islands. He is a representative of SOL Paddle boards out of Telluride and spends part of the year in Telluride, Colorado. Abe is our logistics coordinator for the trip and everyday we will be hiring a local Galapagos Guide to show us the most amazing diversity these islands have to offer. "After meeting the SOL team at the FibArk Festival in Salida, CO a bond was formed immediately. I have been with SOL for 3 years and "it has been the best time of my life." I am native of Ecuador but American at heart. The river is that place where I spend most of my time. I've been a professional paddler full time for the last 10 years exploring rivers in the Arctic to the Patagonia.